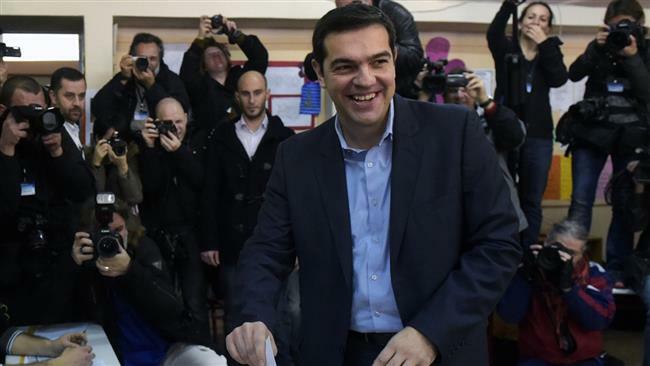 Radical-leftist Syriza party has won a clear victory in Greece’s general election. With nearly 70% of the votes counted, Syriza is projected to win 149 seats, just two short of an absolute majority, though that number could change. Syriza’s leader Alexis Tsipras, who has vowed to renegotiate Greece’s debt with international creditors, said “today the Greeks wrote history”. The ruling New Democracy has come a distant second. Outgoing PM Antonis Samaras has admitted defeat and called Alexis Tsipras to congratulate him. Appearing before jubilant crowds in the capital Athens, Alexis Tsipras, 40, said Greek voters gave Syriza “a clear, powerful mandate”. “You are an example of history which is changing… Your mandate is undoubtedly cancelling the bailouts of austerity and destruction. “The troika for Greece is the thing of the past,” Alexis Tsipras added, referring to Greece’s biggest international lenders – the European Union, International Monetary Fund (IMF) and European Central Bank (ECB). He also promised to negotiate a fair and mutually beneficial financial solution. Alexis Tsipras earlier vowed to reverse many of the austerity measures adopted by Greece since a series of bailouts began in 2010. For his part, Antonis Samaras said earlier: “The Greek people have spoken and I respect their decision,” pointing out that he had inherited a “hot potato” on coming into office and that he and his party had done much to restore his country’s finances. The result is being closely watched outside Greece, where it is believed a Syriza victory could encourage radical leftist parties across Europe. Either way however, partial results from Greece’s election commission showed a clear Syriza lead. With 67% of the votes counted, Syriza is polling 36%, while the New Democracy is a distant second with 28%. An acronym meaning the “Radical Coalition of the Left”, Syriza was formed in 2004 as an umbrella group. It first came to prominence following the 2008 Greek riots. Another five parties – Far-right Golden Dawn and centrist The River – are expected to be represented in the 300-member parliament, beating the 3% threshold. The proportion of votes won by smaller parties will have a large impact on whether Syriza can gain the required 151 parliamentary seats to govern with an absolute majority.